Here’s a list of hotlines that may help you in whatever situation you find yourself in. Check out the bottom for chat and text lines as well! Feeling Overwhelmed? There are a lot of phone numbers on this page. If you don’t know where to start, we suggest dialing 2-1-1 on your phone to be connected with the national human service call center. You can learn more about the 2-1-1 number here. 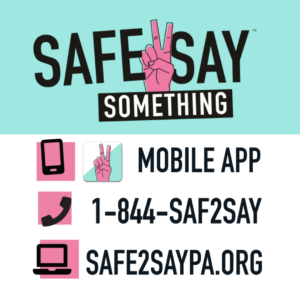 Pennsylvania's Safe2Say Something Program is a state-wide program where students can anonymously report concerning behavior. If you are worried about a friend, learn more about how to send in a tip.